A Baraita giving the thirty-two hermeneutic rules according to which the Bible is interpreted. Abul-Walid ibn Janaḥ is the oldest authority who drew upon this Baraita, but he did not mention it by name. Rashi makes frequent use of it in his commentaries on the Bible and the Talmud. He either briefly calls it the thirty-two rules (Hor. 3a) or designates it as the "Baraita (or sections ) of R. Eliezer b. Jose ha-Gelili" (Gen. ii. 8; Ex. xiv. 24). Also the Karaite Judah Hadassi, who incorporated it in his "Eshkol ha-Kofer," recognized in it the work of this R. Eliezer. It has not been preserved in an independent form; and knowledge of it has been gathered only from the recension transmitted in the methodological work "Keritot," by Samson of Chinon. The beginningof the Baraita in this recension reads as follows: "Whenever you come across the words of R. Eliezer b. Jose ha-Gelili, make a funnel of your ear." Though this sentence already existed in the Baraita as known to Hadassi (see Bacher, in "Monatsschrift," xl. 21), it is naturally a later addition taken from the Talmud (Ḥul. 89a); but it shows that the Baraita of the Thirty-two Rules was early regarded as the work of Eliezer b. Jose ha-Gelili. There are strong grounds for the supposition that the opening sentence of the Baraita ran: "R. Eliezer, the son of R. Jose the Galilean, said." This is the reading of Joshua ha-Levi and Isaiah Horowitz (see Bloch, p. 53); and it is believed that the name of the author did not drop out until the addition of the sentence from the Talmud. Consequently, no adequate reasons exist for doubting the authorship of R. Eliezer. Distinction must, however, be made between two different constituent elements of the Baraita. The enumeration of the thirty-two hermeneutic rules in the first section constitutes the real Baraita as composed by R. Eliezer; and the explanations of each rule in the following thirty-two sections form, as it were, a Gemara to the real Baraita. 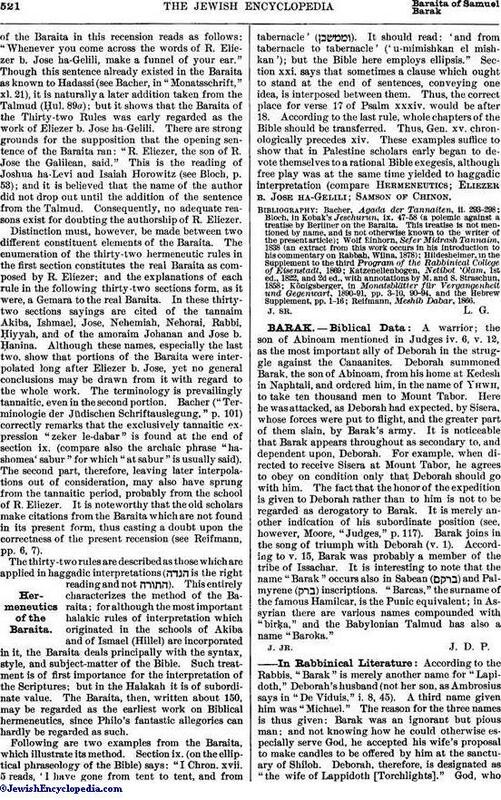 In these thirty-two sections sayings are cited of the tannaim Akiba, Ishmael, Jose, Nehemiah, Nehorai, Rabbi, Ḥiyyah, and of the amoraim Johanan and Jose b. Ḥanina. Although these names, especially the last two, show that portions of the Baraita were interpolated long after Eliezer b. Jose, yet no general conclusions may be drawn from it with regard to the whole work. The terminology is prevailingly tannaitic, even in the second portion. Bacher ("Terminologie der Jüdischen Schriftauslegung," p. 101) correctly remarks that the exclusively tannaitic expression "zeker le-dabar" is found at the end of section ix. (compare also the archaic phrase "hashomea' sabur" for which "at sabur" is usually said). The second part, therefore, leaving later interpolations out of consideration, may also have sprung from the tannaitic period, probably from the school of R. Eliezer. It is noteworthy that the old scholars make citations from the Baraita which are not found in its present form, thus casting a doubt upon the correctness of the present recension (see Reifmann, pp. 6, 7). The thirty-two rules are described as those which are applied in haggadic interpretations ( is the right reading and not ). 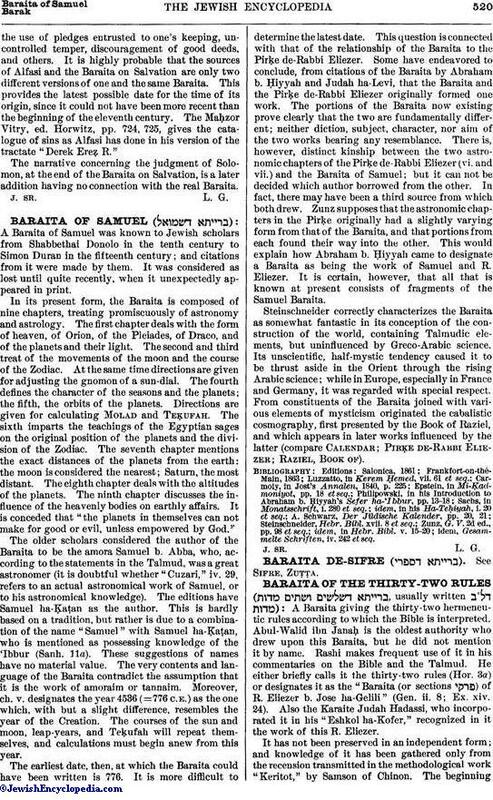 This entirely characterizes the method of the Baraita; for although the most important halakic rules of interpretation which originated in the schools of Akiba and of Ismael (Hillel) are incorporated in it, the Baraita deals principally with the syntax, style, and subject-matter of the Bible. Such treatment is of first importance for the interpretation of the Scriptures; but in the Halakah it is of subordinate value. The Baraita, then, written about 150, may be regarded as the earliest work on Biblical hermeneutics, since Philo's fantastic allegories can hardly be regarded as such. Following are two examples from the Baraita, which illustrate its method. Section ix. (on the elliptical phraseology of the Bible) says: "I Chron. xvii. 5 reads, 'I have gone from tent to tent, and from tabernacle' ( ). It should read: 'and from tabernacle to tabernacle' ('u-mimishkan el mishkan'); but the Bible here employs ellipsis." Section xxi. says that sometimes a clause which ought to stand at the end of sentences, conveying one idea, is interposed between them. Thus, the correct place for verse 17 of Psalm xxxiv. would be after 18. According to the last rule, whole chapters of the Bible should be transferred. Thus, Gen. xv. chronologically precedes xiv. These examples suffice to show that in Palestine scholars early began to devote themselves to a rational Bible exegesis, although free play was at the same time yielded to haggadic interpretation (compare Hermeneutics; Eliezer b. Jose ha-Gelili; Samson of Chinon.